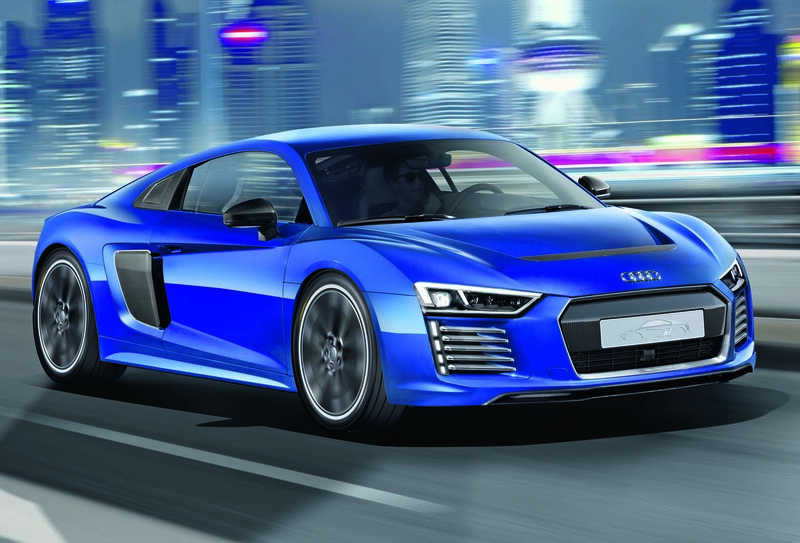 Audi will reinvent the R8 as an electric supercar in 2022 – a move that will spell the end for the use of V10 engines by the firm. V10s have been a staple of Audi’s most exciting performance models over the past couple of decades. However, the adoption of the all-electric drivetrain for the third generation of its range-topping supercar highlights two unstoppable trends: the rise of electric power and the end of big, high-revving, normally aspirated engines being used without electrical assistance. Audi is also winding down the use of V8 engines, with the latest RS4 and RS5 models switching to downsized turbo V6s, leaving the bigger V8s as the preserve of the most potent models in the A6, A7 and A8 ranges, as well as the bruising SQ7 SUV. Audi created a limited-run E-tron version of the original R8 in 2015 as its first step towards electrified performance cars. However, it will go one step further with the third-generation model by launching the R8 solely as an electric car, making it a radically different proposition from today’s model, senior company sources have hinted. It will likely take inspiration from the PB18 e-tron concept, revealed at this year's Pebble Beach Concours d'Elegance. With no combustion engine to find room for, the three motor, 764bhp concept uses a shooting brake-like rear end for greater interior space and improved day-to-day usability than the current R8. Performance is still paramount, however, with Audi theorising a top speed in excess of 186mph, and a 0-62mph time of "scarcely more than two seconds". The firm is positioning itself as a leader in electric cars as part of plans to sell 800,000 electrified models – around a third of its sales – by 2025. This is in response to ever- stricter emissions regulations in all major global markets, and the opportunities such vehicles present in particular in China, the world’s largest car market that wants to quickly establish itself as the global front-runner for electric cars. The R8 was a hit when it was launched in 2006 as a stunning range-topping supercar to crown Audi’s huge model expansion, but the second-generation R8, unveiled in 2015, has not had the same success. Annual sales of the first-generation model peaked at almost 3000 in Europe in 2008. The current model has yet to reach 1500 units a year in Europe. US sales have followed a similar trend. It was understood that Audi had shelved plans to launch a third-generation R8 after the relative disappointment of the current model, but the push towards creating a whole range of all-electric models for its E-tron stable has led the firm to reconsider its position. As an electric vehicle developed with pure performance intent, the third-generation R8 could feature some of the most impressive figures of any car on sale. With four-wheel drive, instant torque from its electric motors and perhaps as much as 1000bhp, it is likely to have a 0-62mph time of about 2.0sec. To link the R8 with the E-tron badge that all electrified Audis will adopt, it is likely to use the name R8 E-tron once more. The first electric Audi will be revealed in September and will simply be called E-tron, a more rakish Q5-sized vehicle that was known as the Q6 E-tron at one point in its development. Before the next R8 is launched, the E-tron Sportback – a rakish sibling to the E-tron – will arrive, followed by a model developed by the firm’s Audi Sport performance division: the E-tron GT. With Audi and Porsche tasked with co-developing the Volkswagen Group’s large electric models, that car will be a twin-motor, four-wheel- drive sister car to the Porsche Taycan (previously known as the Mission E), based on the J1 platform. The E-tron GT will feature a two-door, four-seat design and offer more than 800bhp. The model was shown off in a darkened preview image at Audi’s annual financial results conference in April and it is set to go into production in Germany in 2020. Much of the technology in that car is likely to be transferred into the third-generation R8, including potentially its J1 architecture, although floor-mounted battery packs are not conducive to low-slung supercars. The E-tron GT will be built in the same factory as the current R8, in Neckarsulm, Germany. The next R8 will enter a very different-looking supercar segment in 2022 as electrification takes hold. McLaren, Ferrari and Porsche are all set to have hybrid technology in production by that time, and the current R8’s sister car, the Lamborghini Huracán, will be replaced with a plug-in hybrid drivetrain model. The Italian firm will use hybrid technology as a way to reduce its CO2 emissions while also being able to preserve the naturally aspirated V10 engine on which much of its brand image is built. Lamborghini’s volumes are still not great enough to justify the Huracán being the only VW Group model based on a newly developed mid-engined architecture. The Huracán could carry on using an updated version of the existing platform, modified to accommodate a hybrid system with a V10 engine. Tantalisingly, another option could be for the Huracán to use an all-new next-generation platform shared with Porsche’s long-rumoured mid-engined supercar model. That way, the mid-engined Porsche would replace the R8 as a sister car to the next Huracán, leaving the R8 to switch to an electric-only architecture. The biggest problem for the current R8 was always the Huracan. If you were on the market for one of those it was completely justified to spend the extra and get the Lamborghini. Huracan and R8 play to different clientele. Both rich, but some do not want to show off in a way that Lamborghini, even the baby one, makes you show off. Moreover, they drove differently, read the back-to-back comparisons of Huracan and R8. Still, the way one comes across driving one or the other was the main choice differentiator, I am sure of it. Come on join the Party! Seems a logical step to me, everyone else is or will be going this route, whether it’ll be any good or not depends on how much more weight Batteries add. I wish I could be even the slightest bit interested in these very fast appliances, but I feel absolutely nothing at all. Acceleration? Sure, but bikes have always been way faster than cars, and that was never the point. If you want to go very fast very quickly, get on an easyjet. I had the benefit of a loan of a current R8 for a weekend recently. The intoxicating thing about it wasn't the performance, or the handling - driving on public roads is well within the performance envelope of a mid-range hatchback, let alone a supercar. No, it was the visceral snarling of the V10 behind my head. At any speed, it added a true sense of occasion to everything. The wailing 90s F1-style howl if you gave it full throttle away from a roundabout was both magnificent and addictive. The same performance without the mechanical drama behind me? Can't say I'm very interested. I had the benefit of a loan of a current R8 for a weekend recently. The intoxicating thing about it wasn't the performance, or the handling - driving on public roads is well within the performance envelope of a mid-range hatchback, let alone a supercar. No, it was the visceral snarling of the V10 behind my head. At any speed, it added a true sense of occasion to everything. The wailing 90s F1-style howl if you gave it full throttle away from a roundabout was both magnificent and addictive. The same performance without the mechanical drama behind me? Can't say I'm very interested. Absolutely agree, this V10 was one of the few magical sounding engines still in production. Thankfully it will be retained in the next generation Huracan, Hybrid or not. The Huracan makes a delish sound too, maybe it’s the same Engine..? I am not cocky about Audi's ability to deliver a hyper car. But going by the barrage of stories of (fictional) Audi electrified cars, boy they sure got a hyper PR. Just what we need -- another 1000hp car. I have no interest in this whatsoever.